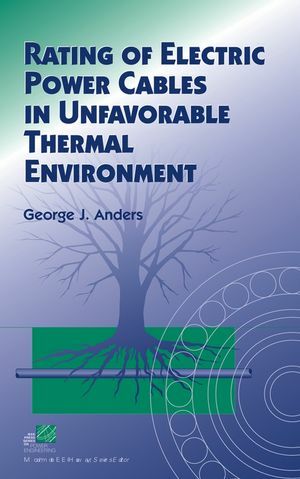 Rating of Electric Power Cables in Unfavorable Thermal Environment is the first text to provide you with the computational tools and techniques needed to successfully design and install power cables in areas affected by such factors as outside heat sources, ground moisture, or impediments to heat dissipation. After thoroughly reviewing standard rating models, the author discusses several new techniques designed to improve cable ampacity, as well as new computational techniques for analysis of cyclic loads. To facilitate computational tasks he utilizes six representational model cables throughout the book, including transmission-class, high-voltage, distribution, and bundled types. End-of-chapter summaries, liberal numerical examples, and practical, real world applications make this text a valuable resource for making better design and operation decisions. GEORGE J. ANDERS, PhD, received a master's degree in electrical engineering from the Technical University of Lodz in Poland in 1973 and an MSc degree in mathematics and a PhD in power system reliability from the University of Toronto in 1977 and 1980, respectively. In 2000, he received a doctor of science degree from the Technical University of Lodz. Dr. Anders has over thirty years' experience in solving electric power system problems and has been involved in the development of power cable calculation methods and application of advanced techniques in power system analysis. He has written several books, including Rating of Electric Power Cables: Ampacity Computations for Transmission, Distribution, and Industrial Applications, and published over seventy papers in several international journals. Dr. Anders is a Fellow of the IEEE. 1. Review of power cable standard rating methods. 2. Ampacity reduction factors for cables crossing thermally unfavorable regions. 3. Cable crossings - derating considerations. 4. Application of thermal backfills for cables crossing unfavorable thermal environments. 5. Special considerations for real-time rating analysis and deeply buried cables. 6. Installations involving multiple cables in air. 7. Rating of pipe-type cables with slow circulation of dielectric fluid. Appendix A: Computations of the mean moisture content in media surrounding underground power cables. Appendix B: Estimation of backfill thermal resistivity. Appendix C: Equations for dielectric fluid parameters.